During the 1980s, 1990s and 2000s, while some commercial TV stations ended their broadcast day with a sermonette or insprational piece, numerous public TV outlets closed out theirs with the five-minute program hosted by the late great astronomer Jack Foley Horkheimer (1938-2010). The Star Hustler recorded here is for the week of 21-27 October 1985, the year the show first went national (it's now called Star Gazers with different hosts). Also included here are various promos for WHA-TV programming.  The sign-off is of a "Plain Jane" type, with static station ID graphic, voice-over announcement and music. No patriotic film of any kind was used by WHA-TV for their sign-offs. The flagship station of Wisconsin Public Television (WPT) was launched in May of 1954 as the video sibling of the University of Wisconsin's historic WHA Radio AM 970, which roots go back to 1915 as experimental station 9XM. During the 1970s the Wisconsin Educational Communications Board created five satellite stations to telecast WHA-TV's programming throughout the state. The WHA-TV network adopted the name Wisconsin Public Television in 1986, the year after this video was made.